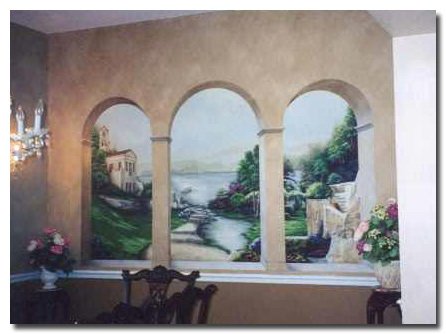 Trompe l'oeil murals are paintings that create an illusion that fool or trick the eye. 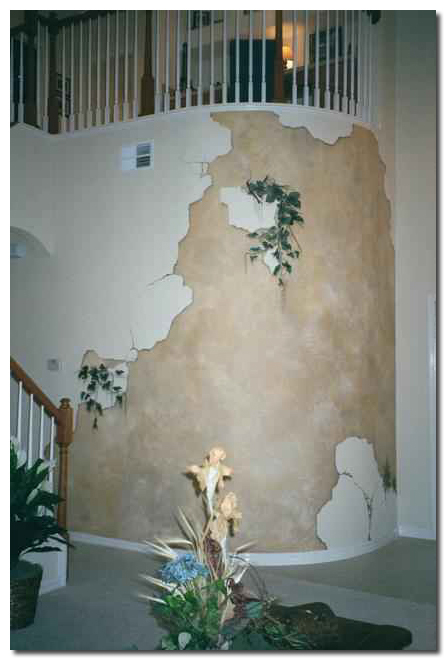 Throughout this web site you will see murals with trompe l'oeil effects painted using faux finishes to create an illusion that fools or tricks the eye. "to trick the eye" or "to fool the eye". Maybe trompe l'oeil can be considered the decorative artist's ultimate gag or trick, and trompe l'oeil artists perform these tricks with paint. 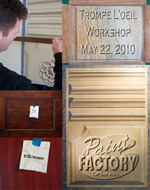 Along with techniques in faux finishing, Art Effects uses skills in trompe l'oeil to create imaginative wall murals in the decorative arts. 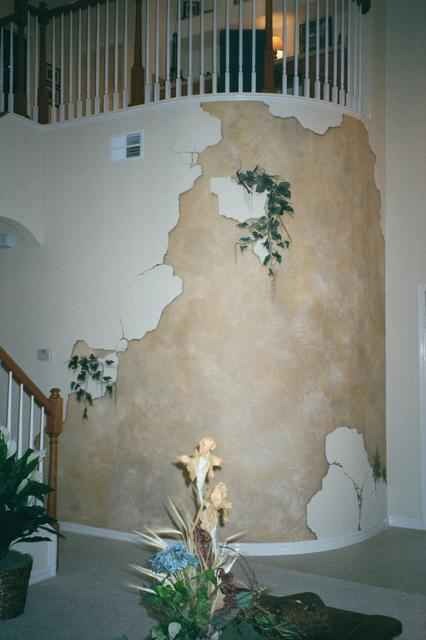 Although most of our painted murals and artwork containing trompe l'oeil are very realistic, realism is not always necessary for a mural or piece of art to accomplish "The Trick". 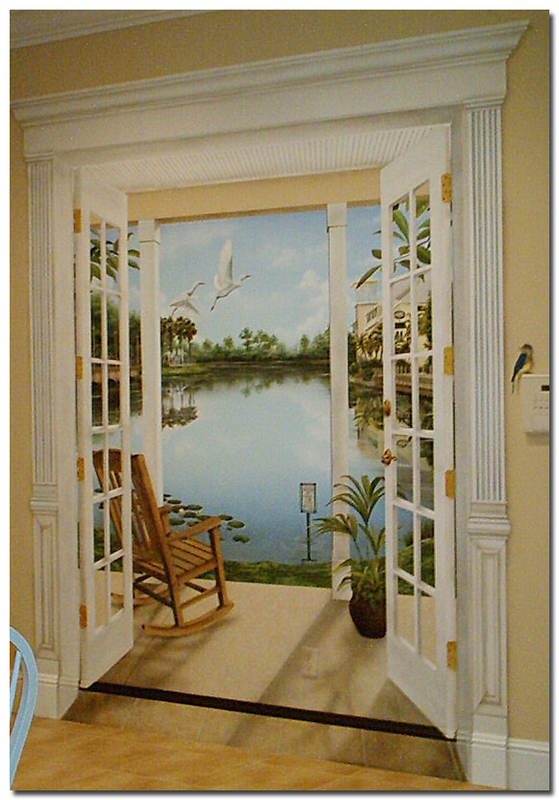 In trompe l'oeil the viewer must only be deceived or tricked for a moment. Trompe L'Oeil..."To Fool or Trick The Eye"
As in our "trompe l'oeil dart board" for example, one might notice the dart board is actually painted, disregarding the dart stuck in the wall. Once the trick is realized and the viewer figures out the dart is painted also, something so simple becomes entertaining. In other words the instant the deception or trick is realized actually becomes more of an impact than the artwork itself. This is what makes a painting, a trompe l'oeil...the trick and deception, the moment the viewer is fooled. 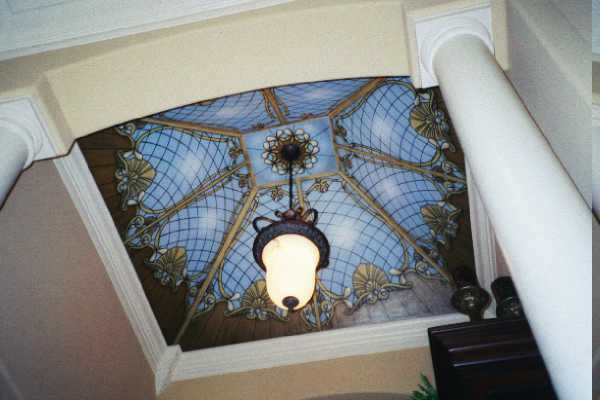 Decorative Painter Sean Crosby teaches a one-day full-on Panel where students will complete a stone background with a trompe l'oeil border in class as they learn about light, shade and shadow. Emphasis will be on striping and molding for this portion. Then, time-permitting, students will add a paper note to the panel that is similar to the one shown above. Class cost is at only $150/stdnt with materials included! on the 22nd of May, 2010! artisticallyspeaking.com created to be the leading online resource of contemporary decorative art and artisans. 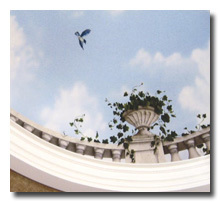 Most "traditional" Trompe l'oeils depict inanimate or stationary objects. Plant life, animals and people etc. are usually expected to move, so the true trick of trompe l'oeil would be lost. However in today's field these are all very common subject matters and thus we have a trompe l'oeil mural.